The Cardiff Half Marathon continues to grow and develop and is now the second largest half marathon in the UK and also a Commonwealth team event. In 2018, the field grew to 25,000 runners and the JAMFUND would like to have a sizeable team in the 2019 event. 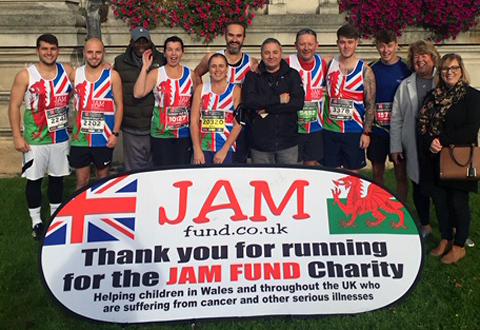 Please come and join “ Jamie’s joggers” and help offer support to children in Wales and throughout the UK who are fighting life threatening illnesses. The charity is very small and does not ask you to raise large amounts in sponsorship and we will provide a team running vest and sponsorship forms. 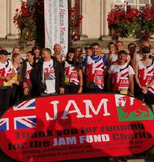 Since 2005, JAM Fund teams in the Cardiff half marathon event have collectively raised tens of thousands of pounds.This has enabled our charity to purchase a wheelchair adapted minibus for a children's hospice and also to donate equipments to children's wards, special schools and individual children. Some children have also been assisted to travel to the USA for medical treatment. THANK YOU TO ALL RUNNERS AND SUPPORTERS - YOU REALLY HAVE MADE A HUGE DIFFERENCE TO MANY CHILDREN!!! Please join us and help us to make a real difference!